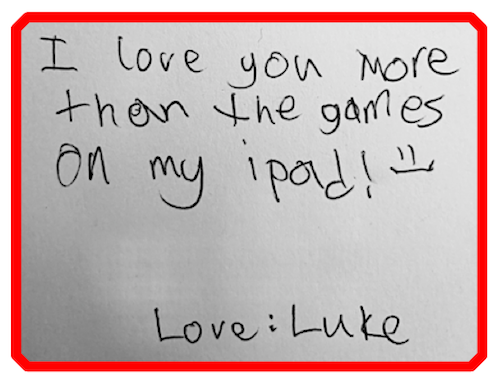 For Father’s Day my son cracked me up when he wrote in my card, “I love you more than the games on my ipad! :)” So touching. But the reality is, my son is growing up in an age where he plays on an ipad as much as he does with physical toys and games. I’m delighted that Lego still captures his imagination as much as Minecraft, and that he’d still rather play outside than on his X-box, but at the same time I have a love-hate relationship with iPad games. There are times I wish he didn’t have one – but I also realize that touch-tablet technology is the world he is growing up in. While he can use the family iMac with ease, it is very likely that by the time he is a teenager, the computers we use will be the technological dinosaurs of a past age. I enjoyed growing up using the very first personal computers and leaping on each advancement as they came out. Even waiting in line for a new Apple OS to be released instead of the free downloads of today. But this ‘Old Dog’ has to recognize that both the reality of this new digital age as well as it’s dangers. Attempting to block, ban or restrict technology would be a pointless gesture that might make me feel better, but would leave my son ill equipped for the world he will be living in. Did you know that YouTube, not Google, is the #1 search engine used by children? Luke would rather watch cartoons like The Amazing World of Gumball or America’s Got Talent on YouTube than on the TV. Why? He has more control. No commercials. He can pause, repeat, skip or move on if it doesn’t capture his attention. He doesn’t even watch movies in order after having seen one once. Why when you can just skip around to the parts you like the best? While this drives parents crazy hearing the same jokes or songs over and over, it is a reality in the “on demand” world of our kids. And we wonder why kids seem more impatient nowadays? Plus, in his world, knowledge is always accessible. No need to read a book or go to the library. In fact, no need for an Internet sazearch, just ask Siri or Alexa and get immediate results spoken back to you. A.I. was once the stuff of movies only, but today, he even turns to these gals for humor and refers to them as though they are part of the family, often forgetting their limits. So how to we engage with our kids during this Digital Age? How do we embrace while also addressing our concerns for our kids innocence and safety? Don’t block your kids from technology. Embrace this new world and equip them. But also train them. Warn them. Be honest without giving detailed “don’t do this” instructions. We used to warn kids about not taking candy from strangers. Today we tell them, don’t talk to strangers online. Don’t give our your name or any details about where you live. There are bad people in the world, we need to be safe. Talk about language and how to turn off or turn away when things aren’t appropriate. I remember my dad teaching me about how to get along safely on the playground or at the mall. Now the playground and mall are carried around by our kids. The dangers aren’t new… they are just more accessible. Be honest and have conversations. Don’t trust kids to have the maturity or will-power to resist things that are tempting. Digital road blocks are good. Have you set Google Search to restrict explicit results? An innocent search can bring up shocking results. Google doesn’t make this setting easy, but it can be done. I’ll let you Google how to do it least my instructions get dated. But do it. Use tools like Disney’s Circle that will filter content as well as set times of day and other limits on what kids can and can’t do or see and even shut off their Internet from bedtime until after school. Very affordable. Takes some effort to set up, but worth it. Another is Our Pact, iPhone software that lets you actually hide games from a device without uninstalling (so you don’t delete kids game progress) for discipline or for a break when a game gets too addicting. Set up a child’s user account on your Netflix so they only see kid-friendly movies and don’t get recommendations from your viewing history as an adult. (How to set up parental controls on Netflix.) These are just a few. My purpose is not to offer tech support on these things – but to say there ARE tools to protect your kids. Use them. I’m sure there are others as well. If so, post recommendations in comments associated with this post either here on Facebook. Wherever you read this, likely on your own portable device. Don’t just hoover and patrol. Join your kids. I run a Minecraft Realm so I can play with my son and other kids so that I can serve as a playground monitor within the game and to provide a place for online community that is safe and vetted. I also run a “clan” on Clash Royale. (It’s called the Kidmin Clan, if you want to join us!) This enables us to play together even when I am traveling and am out of state we can do mini-battles together, chat within the game. I’ve smiled to see my own son admonishing other players who have used minor bad language within the game. (“Dad, he said OMG! And that means…”) He gets that we want a safe place to play where God is honored even in our chat conversations. This is the reality: Our kids are growing up in a digital age. Our job is not to judge, but to join. As in all ages throughout time – the technology never is the issue, it is how it is used. Our job is to equip and train our kids how to use it in a way that honors God, to protect them from mistakes that can result in unwanted influence and to join them so that it is something we model, coach and demonstrate how to use wisely. You will get more opportunity to train when you are there with them, then if you just talk about it remotely. How are you engaging with your kids and technology? JOIN ME in Teaching GO! This Fall! Thank you for a good article. You are right, kids spend so much time playing games on their mobiles. If you try to take the devices, they get irritated and cry. My family found a solution. We installed a great parental control app. It is called Kidslox (www.kidslox.com). We’ve set the restrictions and schedules, and now we do not have quarrels anymore. Of course, my son does not like this app much, but I explained that it is needed to save his eyesight and to have time for homework and other chores.